How about a little after-dinner treat? Our Low FODMAP Irish Coffee is classic, combining brewed black coffee, whiskey, a touch of sugar and cream. Dessert and hot beverage all in one. Yes, whiskey is low FODMAP in amounts of 1 ounce (30 ml/2 tablespoons)! Some recipes for Irish Coffee finish it off with whipped cream, and you certainly can. Whipped cream is low FODMAP in ½ cup (60 g) amounts – and you only need a dollop for this recipe! A fraction of that! Or, you could try floating some cream on top of your drink. This is accomplished by slowly pouring cream over the back of a spoon so that it gently pools on top of your beverage. It doesn’t always work, as my pictures attest. 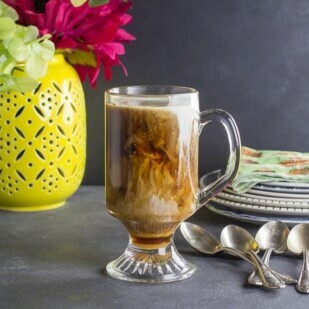 I wanted to show you the layered look of a cream “float” on top of the dark brown coffee, but the cream decided to sink…so I took advantage and shot several images – and I think it looks pretty damn cool. This recipe is best enjoyed if you and coffee get along – symptom wise. While coffee does not contain FODMAPs, it can still trigger GI symptoms for many. Read our article, The Low FODMAP Diet, Coffee & Coffee Drinks for more details. You don’t have to be Irish to enjoy our Irish Coffee, but in case you are in an Irish mood, try our Corned Beef & Cabbage, Irish Soda Bread (a lean version and a richer version), Irish Whiskey Chocolate Mousse and…drum roll please – a Low FODMAP Black Velvet Guinness Chocolate Cake. OH YES! 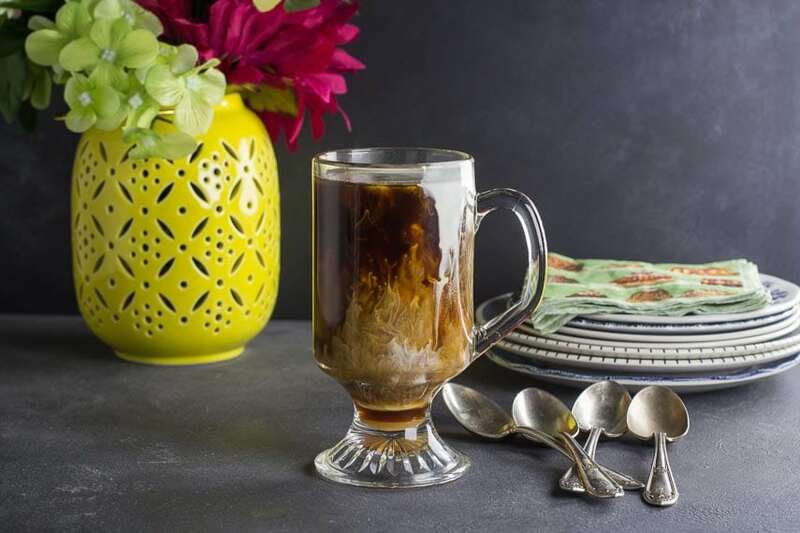 Our Low FODMAP Irish Coffee is best for the adults in the room - it packs a caffeine wallop, with the addition of a shot of low FODMAP whiskey. If you have a clear glass mug, all the better for a pretty effect. Stir together the coffee, whiskey and sugar in a warmed mug until sugar dissolves. Add cream, or a dollop of whipped cream. To “float” the cream (or at least try to), place a teaspoon rounded side up with the spoon just touching the surface of the coffee. Slowly pour the cream over the back of the spoon, allowing it to gently pool on the surface of the coffee. Good luck! It will be delicious any which way.